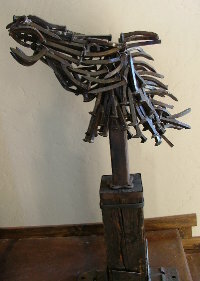 He specializes in sculptures made from reclaimed metal objects, specifically railroad spikes that he masterfully bends to capture motion and movement like this Horse Head. Patrick’s art ranges from small wall hangings and action figures to larger stand alone sculptures several with western themes. 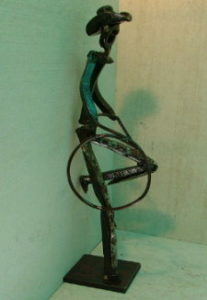 He also creates a wide variety of smaller pieces featuring athletic figures like his scuba diver, ice climber and skier. 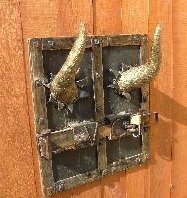 Besides the playful art pieces made with railroad spikes, Pat composes custom work such as gates, railings and large wall art and does a lot of private commission work transforming metal and steel into stylish fixtures and functional pieces for both interior and exterior use. As one might expect, Patrick finds many of his railroad spikes, railroad ties and other discarded metal and steel pieces along the I80 corridor near his home town of Truckee. To learn more about Wild Hair Welding and to contact Patrick for a custom piece, please call him at (530)448-9552 or PatBlide@gmail.com.